This is the second part of a story begun in an earlier post. For the full setting – take a look here. There’s a prehistoric fault line cutting across the moors of the South Penine hills. It is a breathtaking valley, home to an ancient road which has been there since the Bronze age, and it has spawned offshoot ravines which have been there time out of mind. The nearby Eagles Crag is just that: unforgiving, monolithic wall of stone looking down on the villages below. The Pele Tower stood on one of these ravines, with views over this heroic landscape. Gazing out at that each day, how can life for the observer stay within its usual parameters? Surely one would become more and more secure in the knowledge that there is some greater power out there, shaping the tempestuous forms which slept beneath those hills and rocks. But the question is: once you have accepted there is a greater power in charge, which one would you choose? Is God almighty going to let you take the shape of animals to see these places through their eyes, as Merlin did? He did not seem amenable when the fair Lady Sybil began to call. Sybil lived at Bearnshaw Tower in Yorkshire. Astonishing woman, she understood and could interpret the natural world with uncanny ability. She loved that craggy Yorkshire landscape as the Brontes did centuries later, and the same strange power lay in her which formed the stories of Heathcliffe in much more modern times than hers. She roamed the Yorkshire Riding finding puzzles and their answers, becoming known for her vast knowledge and accomplishment. But she hungered for a new way of seeing the world, and God did not seem interested in assisting her to know more. The Devil is always accommodating in these matters. Once can negotiate with Lucifer. He is entirely more reasonable; initially. So Sybil negotiated with him: her soul, in return for undreamt of powers over nature. The Evil One kept his side of the bargain. Locals knew her favourite shape-shift: a white doe would roam the crags and fells, treading paths humans rarely walked, seeing nature at close quarters. The local lord was besotted with Sybil, of course. But women like that: they are wrapped up in their learning. A man, children, domesticity: it would muddy the waters. Lord William Towneley concluded, after years of rejected proposals, that he had best fight fire with fire: and he headed for a fearsome witch for whom the locals had a more than healthy respect. Her name was Mother Helston. All Hallows Eve: and the powers of the enchantress from the Pele Tower were at their annual zenith. Helston had bade the Lord go hunting with his dogs, and they happened upon the white doe and gave immediate chase. Presently a new dog joined the caper: an ugly , cruel brute. Helston had chosen the form she would take carefully. Surprisingly nimble over the crags and precipices, it caught and trapped the doe by the neck. 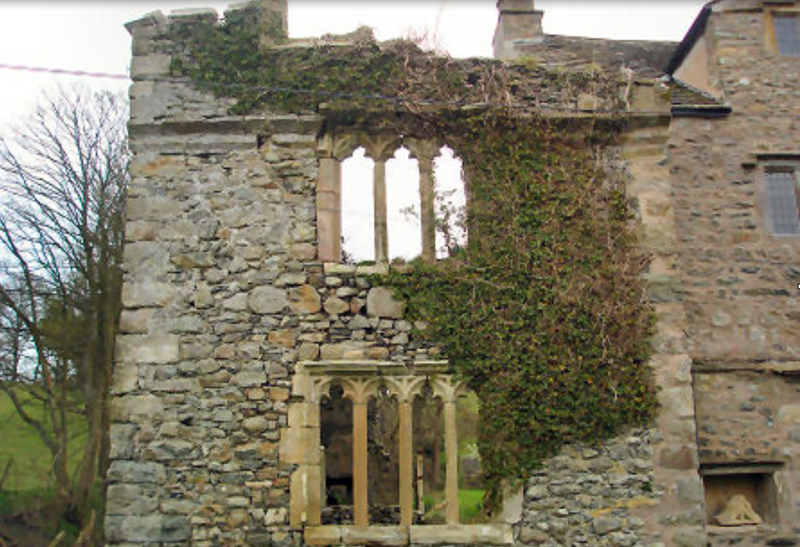 Delighted, Lord William threw a silken leash round the doe’s neck, and took her back to his home, nearby Hapton Tower. Some said they felt an earth tremor that night: and in the morning, Lady Sybil was there in place of the doe. History does not record how willing Sybil was to be led up the aisle to marry Lord William. But her powers of witchcraft were somehow muted by Helston after that night chase, and marry him Sybil did. A leopard can’t change its spots. Despite a promise not to practice, within a year a gorgeous white cat began to appear in the neighbourhood, and it belonged to no-one. The cat loved Cliviger Mill, but the miller was uneasy about it. He set a manservant to watch: and that night the servant saw it, chased it and cut off its paw before it escaped, wailing pitifully. The next morning, a horrifying discovery at Cliviger Mill: a woman’s severed hand, complete with costly signet ring. Sybil never recovered fully. One can survive a hand being cut off; but not the revoking of a whole way of seeing the world. She pined away, giving a member of the local clergy the impression she had recanted her deal with Lucifer. Like her, her tower never recovered. It was never occupied again; and during the 19th century treasure hunters dug away the base so thoroughly that the whole tower collapsed. You can still see the site of Bearnshaw Tower using Google today. We can only hope that its last resident found solace in life after death. I know: there is something Lady of Shalot about her, without all that swooning about with mirrors and needy Knight-yearning. Excellent story, Kate. Why is not already a film? There should be: I wonder if Angelina Jolie has time in her hectic schedule? Beautifully written, Kate . . . but I yowled for the cat’s paw. Thank you, Nancy. Yes: poor Sybil-the-white-cat…. Yup. The severed-hand bit is worthy of Grimm, Jim. Moral of the story…never negotiate with the devil. No. Like a payday loan company,his terms never work out in the long term. Dear Kate, thanks for the link to the first part of this story. Once again, I’ve learned some interesting history from your postings. Thank you. As to the white doe and the lord who captured her with a silken leash, it recalls to me a story from the book “Fairy Tales Every Child Should Know.” My cousin Tommy gave it to me as a Christmas gift in 1944 and I still have this well-worn and treasured book. It’s first story is “The Enchanted Stag. It is part of Grimm’s fairy tales. The story is not the same as yours, but there are similarities. And the illustration in this book that I’ve cherished now for 70 years has always lodged in my mind. Thank you for recalling it to me with your spellbinding words. Peace. Oooh, I must look up The Enchanted Stag, Dee. I love seeing how humans are drawn to the same themes. That is quite a story, indeed. One longs for a way to turn it into something a bit more happily-ever-after. It has strange elements in it – would a deal with Lucifer give snow-white forms, or was she granted power by a non-evil spirit? Lord William was intelligent, resourceful and determined – could he not have developed greater understanding? All themes which could be explored thoroughly in a novel or script, Col. This is a work-in-waiting for someone…. There’s certainly a flavour of that here, a respect for the spiritual attributes of the doe and the cat; though this is about humans who take the shape of animals. You’ve set me thinking now, Helen! Spellbinding storytelling, Kate, as always. Thank you, Chris. Storytelling never fails to cheer me up. One of my personal reading quirks is to study the first line of any given piece. How does the author set the tone for what is come, if it all. I think your opening line is terrific. This part of England has long been on my travel must-see list. Ah, and you must, Silver! The haunt of some of the greatest poets and novelists, and when you arrive you can see why: the very landscape speaks to you. Oh, Kate, well told, as you can do. Well done. What an amazing tale! Really fascinating, Kate. The severed hand is a macabre detail! Adds a little extra punch, Debra. Excellent story. I feel sort of sorry for poor trapped Sybil who just longed to be free. She learned a hard lesson: it doesn’t pay to make a deal with the Devil.